My eighty-seventh podcast is up. I'm all alone this week, talking about planning the house me and my wife built. We used Google Earth to visualize the lot, placing a lot and neighborhood plan in 3D space. 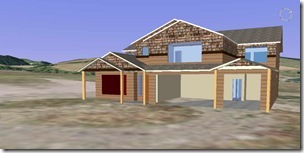 Then, working with our agent, we modeled the architectural plans in Google SketchUp and placed the model in Google Earth.